The St Regis in Abu Dhabi opened its doors fairly recently with the great location of the corniche, a stone throw away from The Hilton, Jumeirah Etihad Towers and Emirates Palace. It is a brave decision considering the competition, but if our dining experience on Christmas Day is an indication of all else, they are going to be successful! 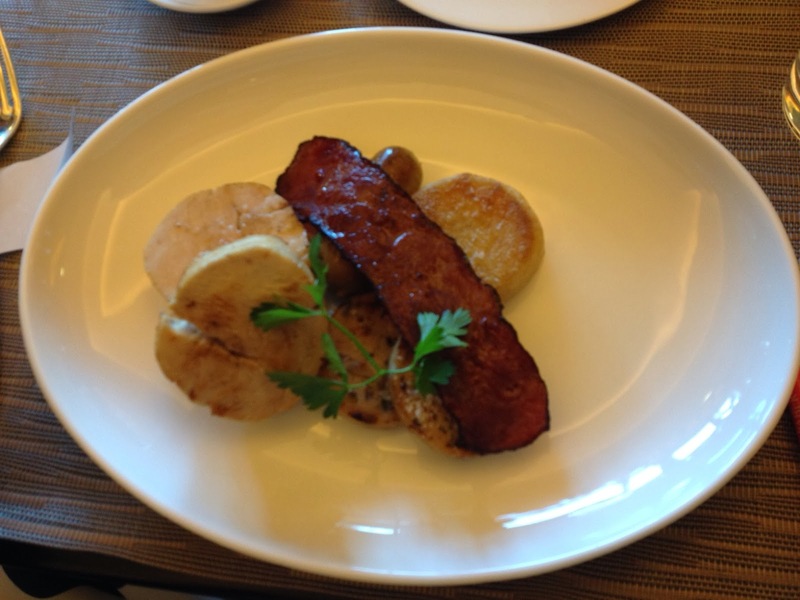 Rhodes 44, the second Gary Rhodes restaurant in The U.A.E. , was to be the venue for our Christmas lunch. I am generally weary of restaurants with celebrity chefs which I feel exploit people's need to be become name droppers. However, let me assure you that Mr Rhodes comes across as warm and sincere. For her photo opportunity with him, my daughter was immediately at ease with him. That is the most definitive statement you could need. But what about the restaurant, and more importantly, the food? 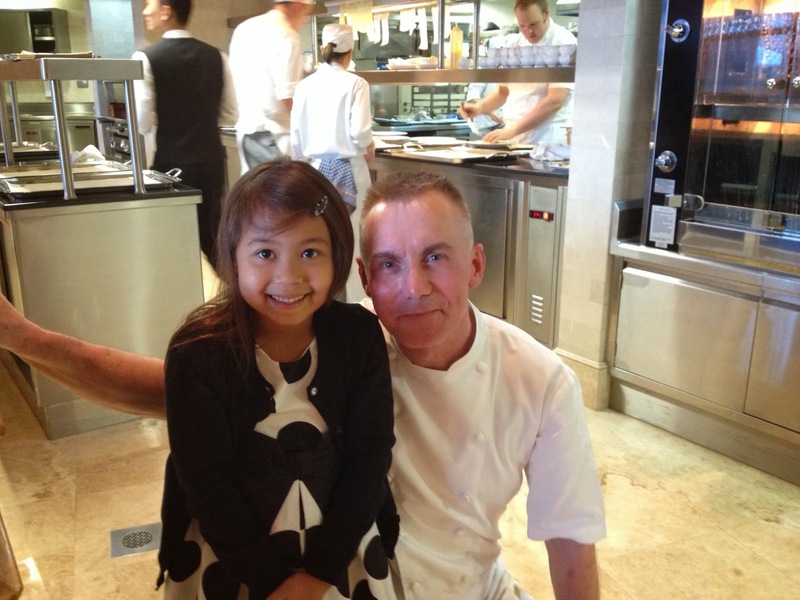 From the mouths of babes: Gary Rhodes got the thumbs up from Mitsuki. The interior is elegant, refined and plush without being overbearing and ostentatious. The natural light afforded by the floor to ceiling windows where we sat made the restaurant even more impressive. Furthermore, while it is not a boutique style restaurant in terms of number of tables, there is more than enough space between tables. Finally, the open kitchen continues the trend in restaurants these days. We were greeted with a glass of Champagne and shown to our seats. It was to be a 4 course set menu. It marked a pleasant change from the buffets which I tend to go for because I have a 7 year old, but as Mitsuki has shown on many occasions, her mature take on food meant that this was not going to be a challenge. So, the idea of being seated for the duration of a meal really appealed to me. I had seen the menu in advance after requesting it by mail, but my thoughts were about Mitsuki. It was quite a mature menu and my question was were they simply going to give her a scaled down version of of the adult meal? I should have known better. There was a special children's menu. Mitsuki started with the cream tomato soup, followed by the Turkey and for dessert she ordered their 3 ice creams selection. I was so thrilled. Actually, she was too and seemed to enjoy not getting up every time for food. 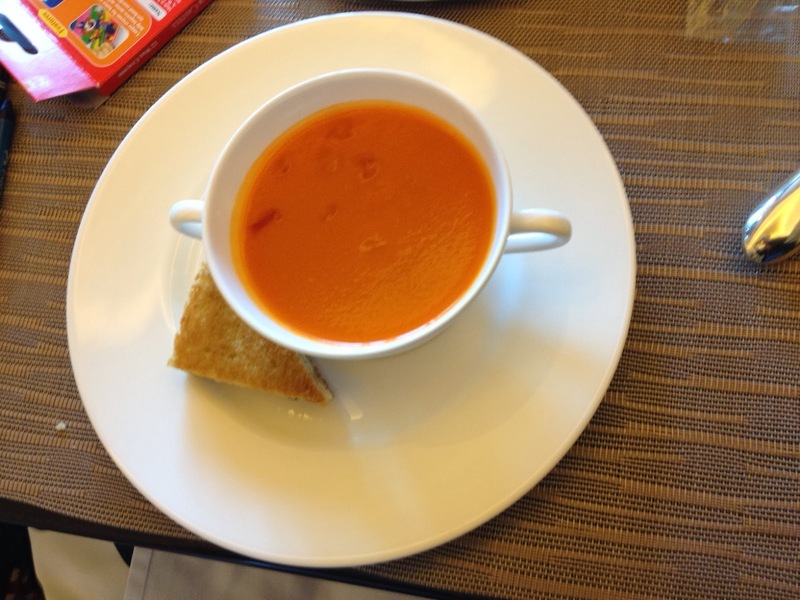 The soup as a starter gave this little guest a feeling of maturity. Do I really need a caption here? Variations of Turkey. Again creative! I started with the White onion and chestnut soup with warm goat's cheese and chive croque monsieur (delicately sized toasted treat). 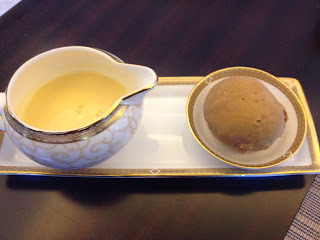 The beauty of the soup, other than the Wedgwood china it was served on, was the subtle flavouring. A winner. I followed this up with a a plate of Asparagus which was exquisite in presentation and taste. It consisted of asparagus and poached egg hollandaise, asparagus soup and sweet lemon asparagus salad. Imaginative and delicious. 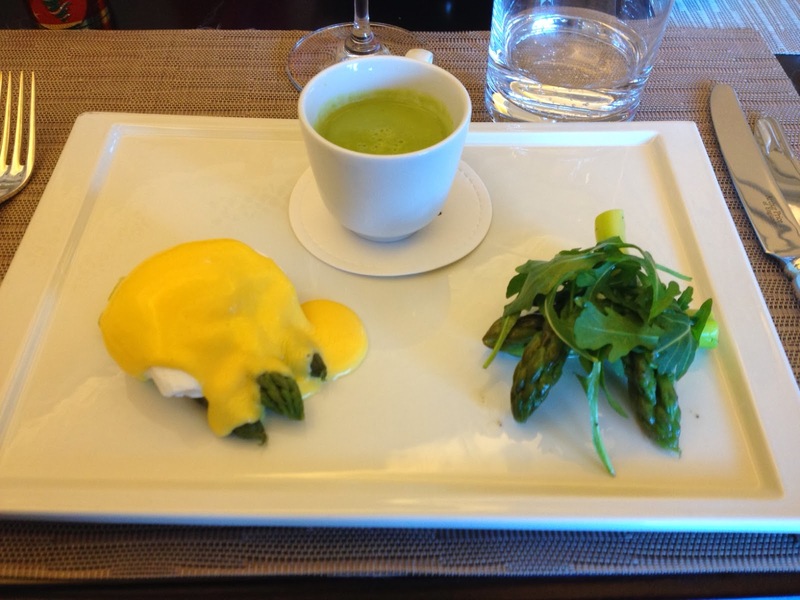 The Asparagus, winner for most immaculate presentation! They offered a 'wine pairing' with the menu. I had a French red (sorry, too preoccupied to write down the name). But I found the word 'pairing' a bit odd. When someone says pairing, it implies a carefully chosen wine by the sommelier to match every dish. That was not the case here. I guess they meant 'free flowing' wine. Nonetheless, I did enjoy it. For my main, and I thought long about this because it was Christmas so the Roast Turkey Wellington (pictured here too) was the obvious choice, but chose the beef instead. The Roast Sirloin of Beef with button mushrooms, onions, tomatoes and tarragon in a red wine source was well presented, cooked, fragrant and flavoursome. 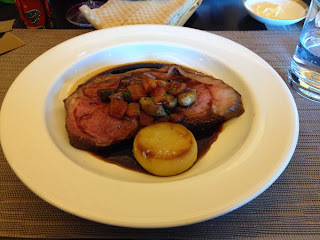 Once before have I had such beautifully cooked beef in Abu Dhabi, and that was at 18 Degrees, Hyatt Capital Gate. However, the creative combinations gave this the edge. 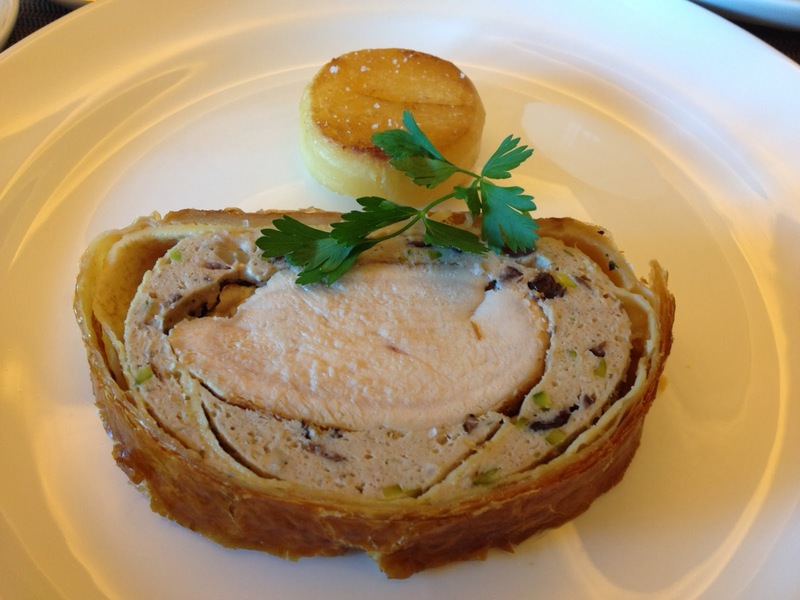 Roast Turkey with chestnut, pistachio and cranberry stuffing. 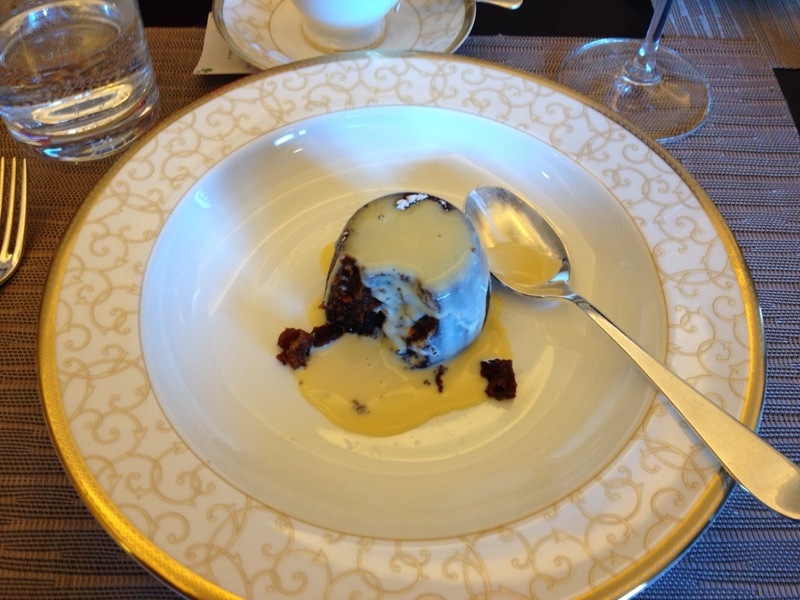 Finally, for dessert, I went the traditional route and had the Traditional Christmas Pudding with toffee ice cream and Bailey's custard. The meals, prepared and overseen by Gary Rhodes were perfectly sized with the exception of Mitsuki's main which for a child was huge. 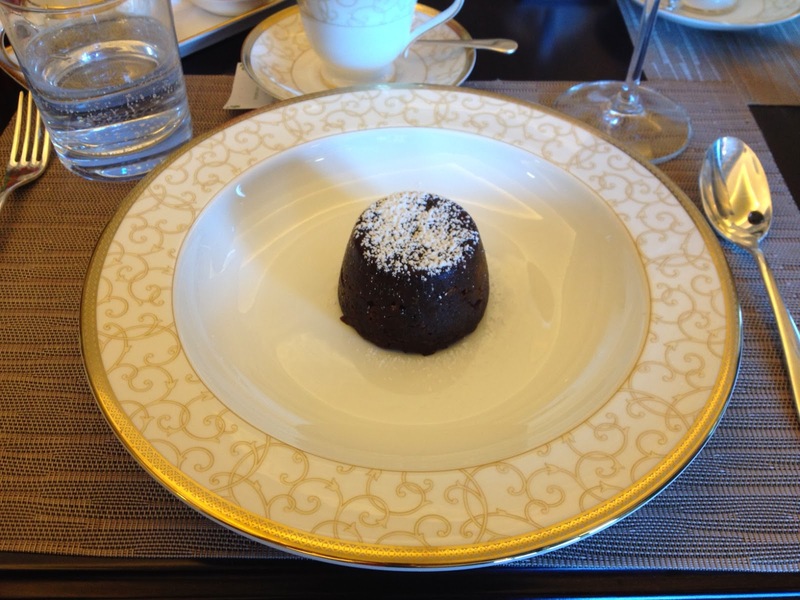 However, with the dessert, the size was perfect. The choice of custard was superb and did not overpower the pudding with its own taste, allowing one to really enjoy the pudding. Baileys custard and toffee ice cream. The service was very good. While there were a couple of misunderstandings with one or two waitresses stemming from language issues, I cannot fault their enthusiasm and eagerness to please. I have no doubt that these minor points will be ironed out. A final mention of the music which was provided by an accomplished pianist who captured the mood so beautifully - she really enhanced the dining occasion. Well all good things come to an end, so the cliche goes and this was indeed a very good thing. It was my first ever restaurant dining experience on Christmas Day and one I will certainly remember.